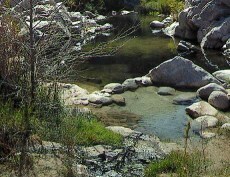 I just got back from the Salton Sea area and I made a trip to Five Palms Warm Spring near Brawley. That Pool was Clean and Crystal clear, the water temperature was 90F.I like the middle where the pipe comes up, warmest spot on a windy day. Lots of animals use that place too, I saw a Kit Fox, A Barn Owl, and countless birds. That place is a true desert oasis. The only problem I had was the people from Glamis driving up and reving up there quads and leaving.No Respect.